Crystal Mountain is a somewhat improbable combination of a museum of semi-precious stones and petting zoo with a roller coaster thrown in for good measure. Its location, some thirty minutes outside of Auckland, is sufficiently remote that we began to wonder whether we'd missed a turn somewhere en route. 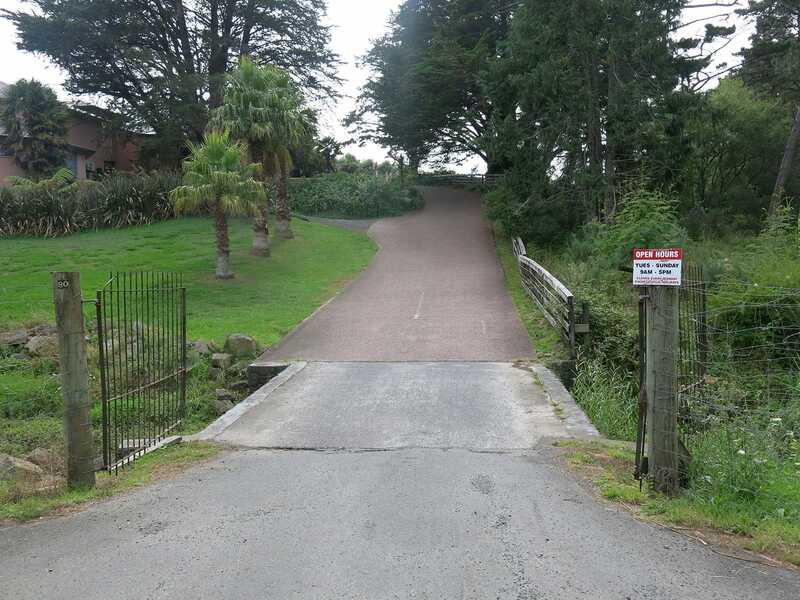 The cry of recalculating never came from the GPS, however, and in due course we arrived at an entrance that could almost have been a residential driveway. There were two other cars in the parking area. The museum opens an hour before the other facilities, and we deliberately timed our arrival to make the most of this. As it turned out we'd have been better off with a lie-in; the exhibits were worth fifteen minutes at the absolute outside, and we only spent that long to make sure that we didn't miss any of unintentional comedy (and spelling mistakes) in the signage. An elaborate stone globe described as being from Chile would have been slightly more impressive were it not for the Made in Peru sticker on its side, and I'm still somewhat intrigued by the Tyrannosaur skull proudly advertised as an original replica, complete with a rodent trap resting in its lower jaw. Admission to the outdoor area cost us fifteen dollars per person, a price that included a bag of animal feed but not the coaster, which was a five dollar upcharge. We were warned that the Gonzales Roller Coaster (#2104) would operate once every thirty minutes, and with that in mind we decided to park ourselves on the station steps while we waited for an attendant. In due course we were both ensconced in the front seat for three laps of what turned out to be a respectable if not terribly exciting ride negotiated without any major jarring. There really wasn't a whole lot else of interest beyond the credit. We noted a small tracked car ride for children, a few animatronic dinosaurs, and a selection of farm animals who promptly relieved us of our animal feed. We were just about to leave when we noticed that the park train, a diesel-powered tractor with two carriages behind it, was about to start. We boarded without realising that we'd sentenced ourselves to ten minutes of being bounced and shaken like tennis balls in a washing machine; the ride was impressively rough given its top speed of no more than two miles per hour. The journey concentrated mainly on the footpaths we'd already walked, but there was a special bonus in the guise of a twenty foot long tunnel filled with oversized spider webs. Rainbow's End is not a large park, but manages to command a healthy fifty-seven dollar admission price by virtue of the fact that it is the only facility of its type in the entire country of New Zealand. In the run up to our trip Megan spent an eternity scouring online discount sites in the hope of finding a discount, and had almost given up when a half price deal became available on GrabOne. Using this required that we enter the park through the nearby amusement arcade, but the process was quick and painless, and we soon had our unlimited wristbands. 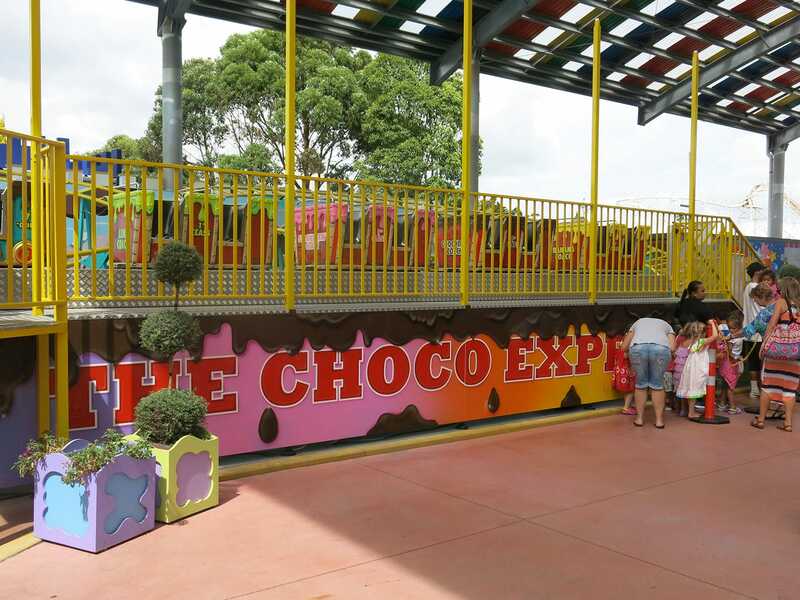 Our first stop was at Choco Express (#2105), a family coaster added to the park two years ago. Trip reports from other enthusiasts had indicated that this ride was open to all, but we found otherwise today; the operator told us that we were not allowed to ride without children eight years of under. We politely explained that we were just trying to ride all the roller coasters in the country, but she stood her ground, and we were leaving the queue to go plead our case at guest services when something truly remarkable happened; a friendly lady who'd overheard our conversation offered to let us ride with her children. It was good to finally be able to ride a SBF Rides Double Coaster MX605, having previously seen two closed versions at Little Playground and Steel Pier. The train on this model was quite colourful, with a fiberglass engine on the front and four coaches labelled lime, strawberry, chocolate, and banana. The layout was simply two helices side by side, with booster wheels on the ascending side of each to prevent the train rolling back, and while the experience was hardly thrilling it did at least have good laterals. On a side note, it's hard for me as an enthusiast to be supportive of parks that choose to operate certain rides with a no adults without children rule. The usual argument made is a desire to reduce wait times, but this falls down when one realises that the vast majority of grown-ups are not going to want to ride smaller attractions anyway. The reality is that rules of this nature constitute little more than park-sponsored discrimination against a subset of visitors who are being arbitrarily told that they can't enjoy certain attractions even though they meet all the safety requirements. I'm not a lawyer (fortunately!) but it does seem to me like the local legislation should prohibit this type of thing. Our next stop was at Corkscrew Coaster. Early photographs of this ride available on RCDB show it with a seven car train, one for each colour of the rainbow, though this had reduced to six by the time I visited in early 2008. Today that number had dropped to five, with the blue and indigo cars being conspicuously absent. Both colours had been painted instead on the inversion above the midway, and the result was far more eye catching than the original white. Once on board the ride quality was as I remembered it, being relatively smooth by Arrow standards, though not exactly B&M. We'd left the best for last. Gold Rush may not have had the enormous budget typical of the usual benchmark mine trains, but its designers used imagination and ingenuity to come up with a truly brilliant layout that manages to be thrilling without being too much for the park's younger visitors. The boarding platform is close to the apex, allowing the four seat cars to begin picking up speed almost immediately as they make their twisted journey through a fully enclosed and heavily themed mine. There is a small lift hill at the half way point that leads to the highlight, a wickedly intense descending S-curve that leads out into daylight at the back of the log flume. From there a short turn around leads to the main lift hill and the end of the ride. The operators here were doing their absolute utmost to keep trains going out at maximum efficiency, which in this case was about one car every thirty seconds. The difference between their attitude and that seen at Warner Bros Movie World could not have been more pronounced, with regular call-outs for people to fill empty seats and no tedious recorded safety announcements on loop. There was no height limit posted on the Enchanted Forest flume today, in contrast to seven years ago, though there was a sign asking those above a certain height to speak with an operator prior to boarding, presumably so that they could be forewarned about clearance issues. The layout began with a small lift hill and a gentle cruise through trees, followed by a second lift hill and gentle splashdown. The second section passed through a beautifully themed area filled with pirates and a sinking boat, before proceeding through a waterfall into a dark ride building complete with a catchy tune. The final lift and large splash provided a gentle spray that was refreshing without being drenching. We decided to forego most of the flat rides, but decided that it would be nice to try the Fear Fall drop tower, an eighteen storey model that is the tallest structure in the park by some margin. The ride programme wasted no time at all, taking about twenty seconds to go up, pause briefly, and come back down. It would have been sensible for me to sit out the Invader Disko Coaster given my empty stomach, but I decided to ride against Megan's advice and ended up feeling decidedly unsettled as a result. However, I was able to recover quickly enough to manage three more rides on Gold Rush before it was time to leave.